The process of building our own home for the first time has got me thinking about what the concept of “Home” means to me and to others and how different house styles and designs may influence that concept. In my case, I think childhood literature had a huge impact on my idea of how a real home should look and how it should feel. I would be very interested to know if other people feel the same? And if anyone else out there remembers movies for the houses featured rather than for the story lines? ‘Howard’s End’ and ‘Something’s got to Give’ are two that spring immediately to mind. I can still remember exactly where I was when I read that and my own bedroom seemed very conservative in comparison. Needless to say, our new house will have several skylights. The books in which I immersed myself as a child may also explain why I have always responded best to the traditional style houses most often found in Britain and the States. Growing up in fifties and sixties South Africa, we were bombarded with British and American literature and kept firmly away from our own. I can admire modern, cubist, glass and steel houses for all the light and practicality they may offer: I am often awestruck by their cantilevered, engineered prowess, but I have absolutely no emotional resonance with them. I remain completely unmoved by size and grandeur and respond stubbornly only to what I perceive, completely subjectively, as charm. And when it comes to houses, charm for me translates into pitched roofs (further enhanced by attics and lofts), wood framed windows, preferably cottage-paned or sash chimneys, verandas, wind-vanes and porches. I admit to having a bit of a ‘thing’ about pitch and have just increased the slope of our new house by 5 degrees. I am suspicious of flat roofs and believe them to have a determined tendency to leak. Porches and Pitched Brosely tiled roof. Straight out of childhood English literature. I was not born into one of these ‘English’ houses and did not grow up in one, but even as a child I would pick them out in my small South African coastal town and wonder what it would be like to live in them. Not to say I didn’t grow up in a beautiful home. 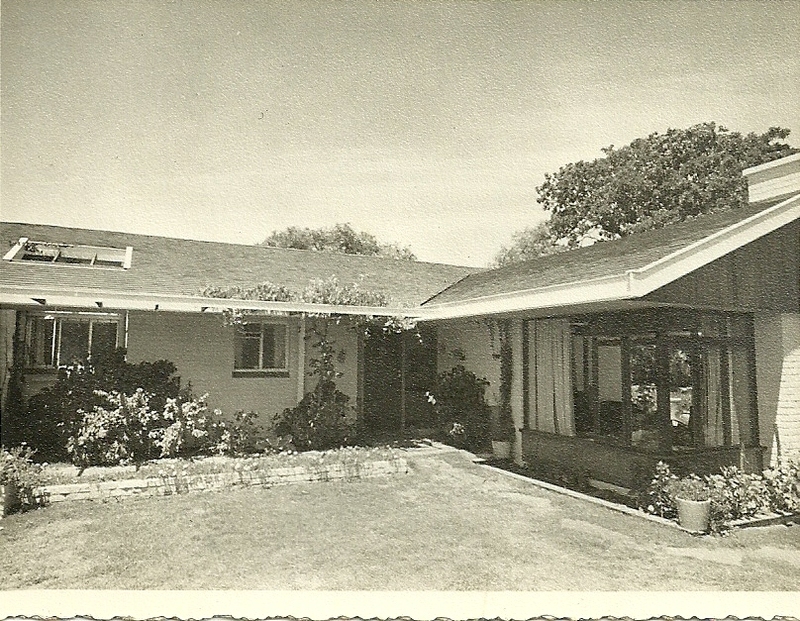 The daughter of an architect, I spent the first 11 years of my life in a lovely house designed by my father in the 1950ties to suit perfectly both the sub-tropical climate in which we lived and the property, an old quarry site, on which the house was built. In our small town, the house made a considerable statement in its day: It was the first home in East London to be built ‘back to front’ – that is, with the entertaining area and main garden facing away from the street. It was also one of the first houses to be built there with privacy in mind. Although the walls bordering the street were not particularly high, they were backed by dense shrubbery through which it was quite impossible to see. Apparently this was much discussed and the house became a destination for slow, Sunday afternoon drives. It was the first house in town to have its own swimming pool and a ‘carport’ on the street. It had a name too; ‘Many Stones’ – a nod to the quarry site on which it was built. 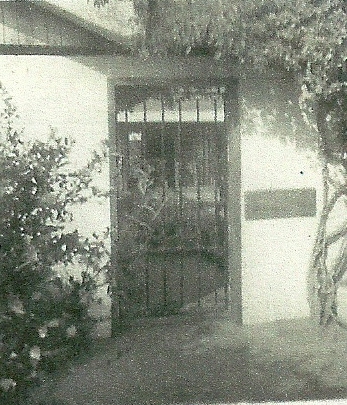 Although in those days there was no need for locked gates and electric fences, access was through a beautiful, custom-made wrought iron gate which I remember clearly to this day. I remember a conversation with my father, not long before he died, in which he expressed surprise at the detail with which I recalled that home and garden. 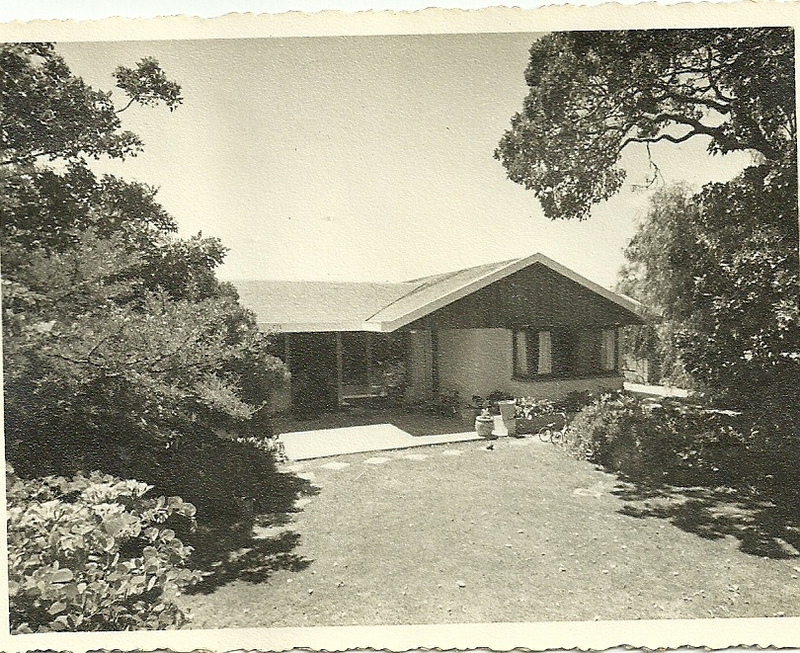 With hindsight I have also come to appreciate that my mother was a gifted gardener and the garden she created around that home, on only half an acre of multi-levelled, rocky ground was spectacular and a child’s paradise. Perhaps children experience houses and gardens more intensely than adults. A garden in not only admired, it is lived in and explored. In that garden, hideaways and secret dens were created under shrubs and in tree houses, a felled tree trunk became a crocodile, rope ladders and swings evoked the Swiss Family Robinson, while two elusive tortoises, a parrot in a courtyard, a menagerie of pets and a fish pond with stepping stones a dark, mossy grotto could keep children occupied for hours. That garden in that relatively small space offered way more interest and entertainment than acres of manicured lawn surrounded by tame flowerbeds could ever equal. 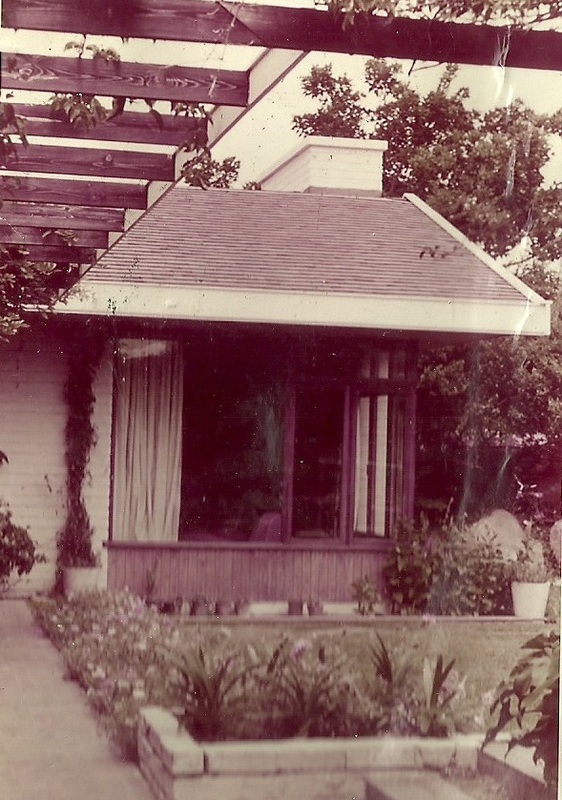 My mother was ahead of herself and in another era may have been a landscape architect rather than a teacher. Front Garden. Cutaway roof section to allow light into the passage. Back garden looking towards the pergola-covered patio. Study window on the right. 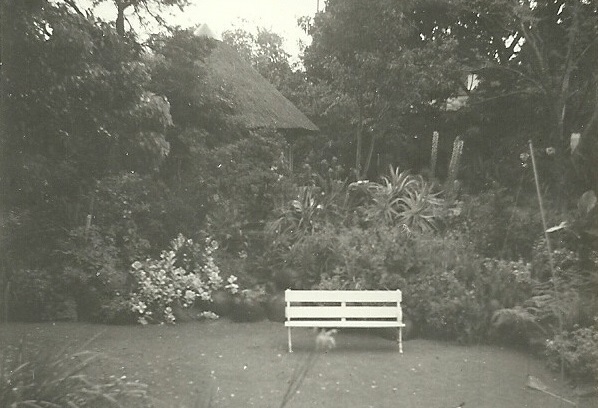 View of the back garden with guest ‘rondavel’ on higher terrace. Rockery built from on site quarry stones. 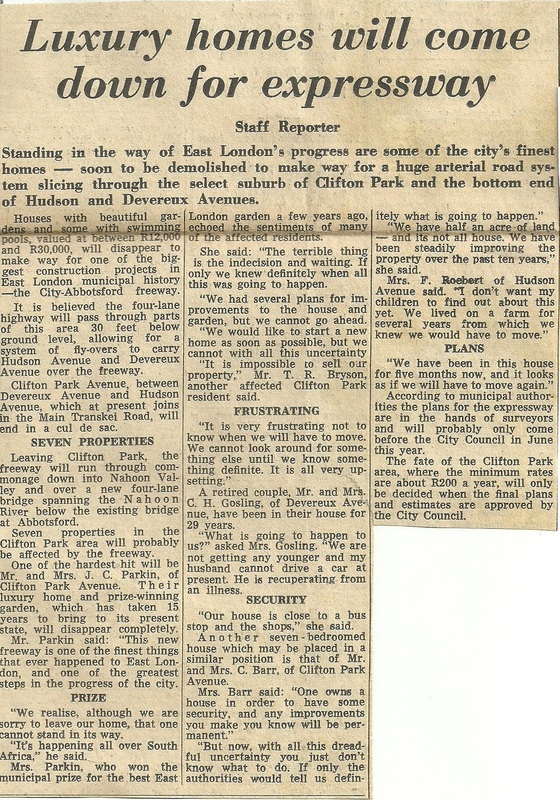 I still remember the acute sense of shock in our household on hearing that a major highway was to be built right through our neighbourhood and that our house, being directly in its path, along with 6 others, was going to have to be demolished. It must have broken my parents’ hearts and still to this day, on the rare occasion I find myself back in East London, I can’t help driving down that crudely truncated little road to the edge of the chasm through which the freeway now runs and thinking about the magical place that once existed there and the loss my family experienced through its obliteration. 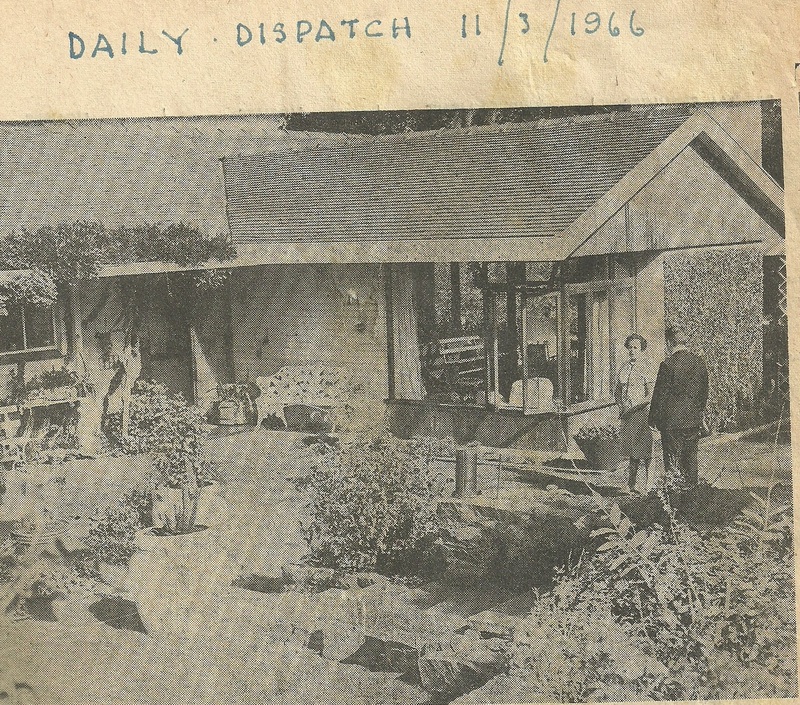 Daily Dispatch reporter interviewing my mother. The white, wrought iron bench in the centre of this photo is now in my garden. Despite these surroundings, driving around that small town as a passenger in my mother’s car, I would still pick out the more English-looking houses and I would often comment on them and ask about them. There was one I remember particularly well. It was in St James Road in Southernwood, opposite the post office we often used. I believe it is now a nursing home which makes sense. It was huge and double-storied with gables, wings and chimneys. The fact that it was dark and looked cold didn’t bother me a bit. 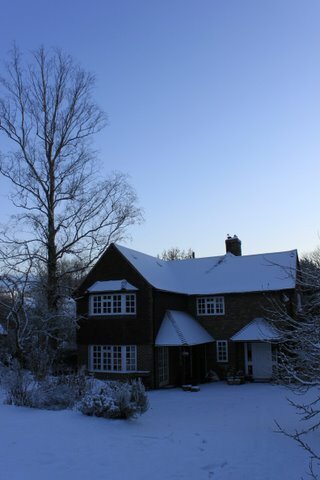 It looked exactly like a house I’d read about in a “June and Schoolfriend Annual” and all I wanted was to see inside it. I asked about it endlessly and my mother probably wondered why. These houses might have been pretty but they often faced south – the wrong way in the Southern Hemisphere – and were completely impractical either for the climate or the typical South African lifestyle. But such was the power of childhood literature and an active imagination, I dreamt of living in a double-storey house with a steeply pitched roof of slate, shingle, Broseley tile or even thatch, and cottage-paned windows. That sort of house exuded charm for me then and to a certain extent, exudes it still. My father, influenced by Frank Lloyd Wright, would have been horrified. Charm in a house is an elusive quality. As ‘beauty lies in the eye of the beholder’, it is different things to different people. Despite all the alterations in the world, it is difficult to imbue an intrinsically ugly house with it. I came across a quote once, attributed to Laurie Lee, that described the human quality, but it lends itself just as well to buildings. Anyone who has rounded a bend or crested a hill only to have their breath snatched away by the view of a beautiful house ahead will know exactly what this means. Over the years I’ve become more comfortable with being South African in a changed political landscape, and though I’m still drawn to many English and American homes, I have come to love and appreciate many styles of old South African architecture just as much. The Cape Dutch architecture around Cape Town can hardly fail to appeal but more and more, it is the old farm houses I love with their wrap-around verandas, ‘tin’ roofs, creaky wooden floors and reluctant sash windows. The long drive from Johannesburg through the Karoo to Cape Town, has become so much more beguiling as a result; I wait for certain favourites to come into view. And if there is a windmill nearby, so much the better. Well, we couldn’t find an old farmhouse into which we could ‘downsize’ in Johannesburg and most of the little houses with corrugated iron roofs that remain here are in parts of the city that are no longer comfortable. 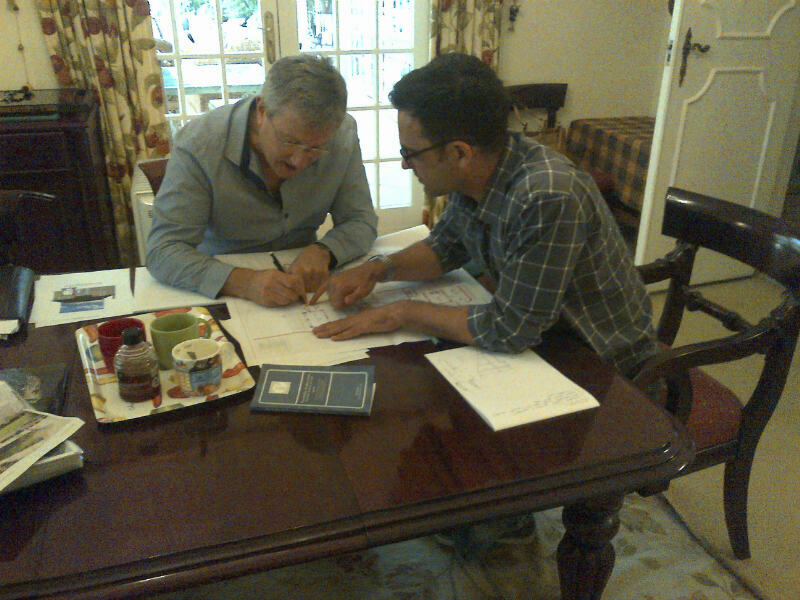 After looking long and hard for something to buy or renovate, we eventually decided that building would be our best option. 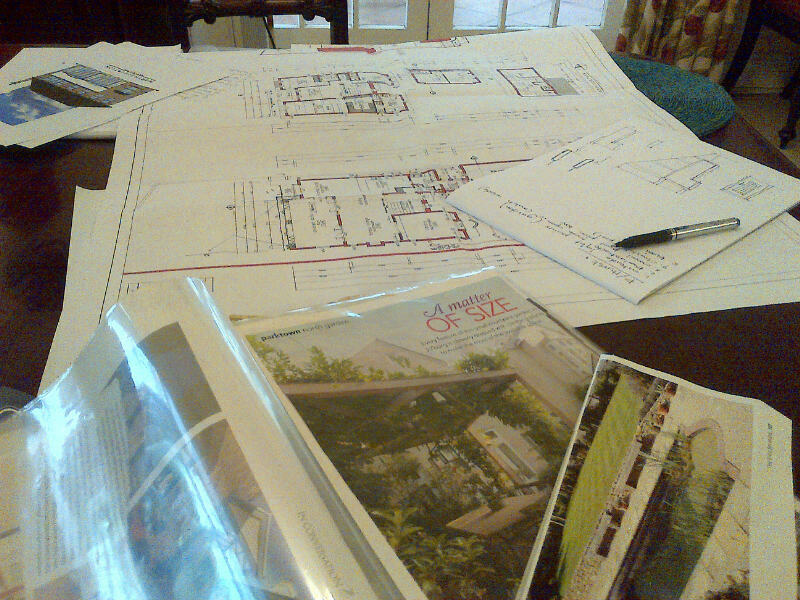 My brief to the architect was just that; brief: An iron roof, wooden floors, sash windows, open plan. And then, because of the narrowness of the stand, double-storied. 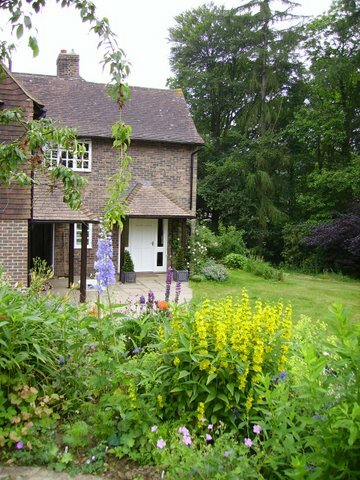 Bernard’s response was immediate and to the point: “A contemporary farmhouse”. That sounded like what we were looking for. 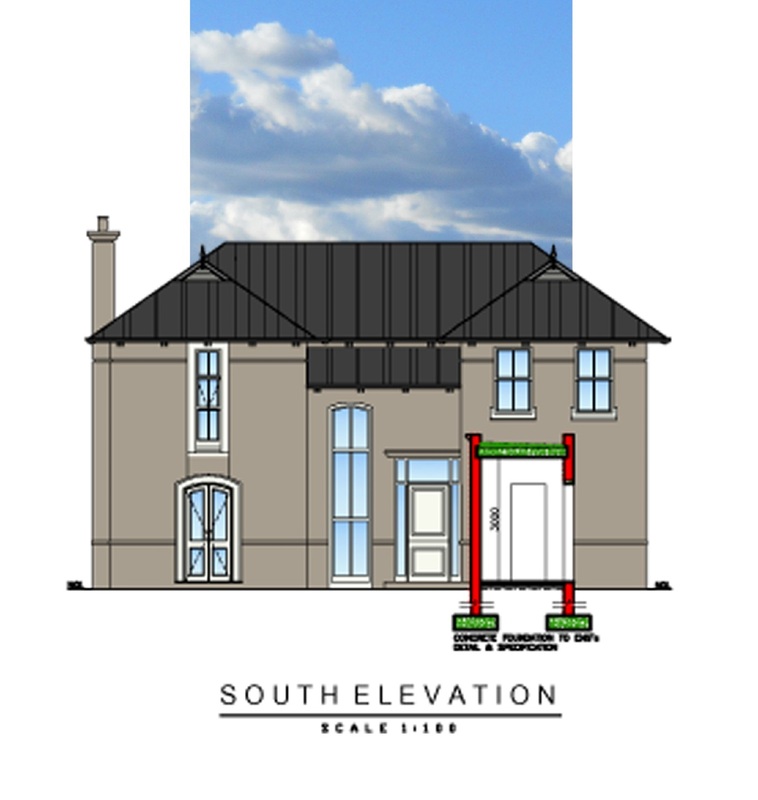 Almost up-to-date impression of the north elevation. South Elevation. Some changes have been made, including increasing the roof pitch slightly. 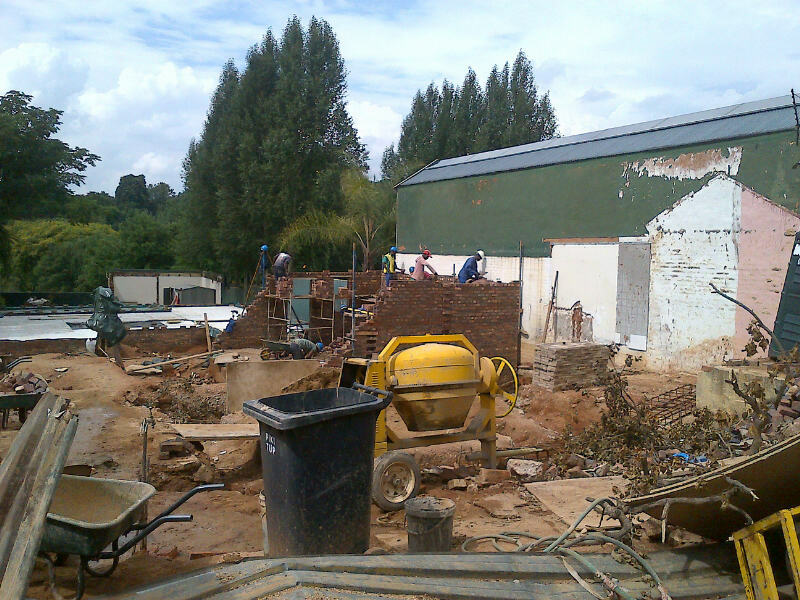 South African Builders’ annual holidays start tomorrow and with the persistent heavy rain we’re experiencing in Johannesburg, it’s really not a bad thing. This has been an unsettled week all round. We’ve all felt the impact of Mandela’s death and even though there have been no official holidays, there’s been a kind of ‘slowing down’ all over the country as we all pause to consider our loss. 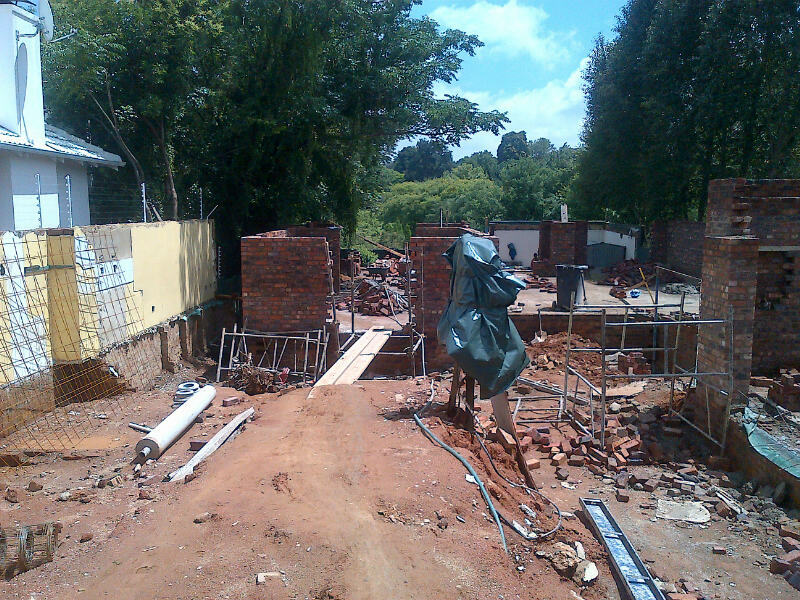 I was surprised at how much more brickwork there was since my last visit, given the uncooperative weather…. Back (south) wall of the library. East wall of kitchen and living room going up. The bin is standing in the entrance hall. 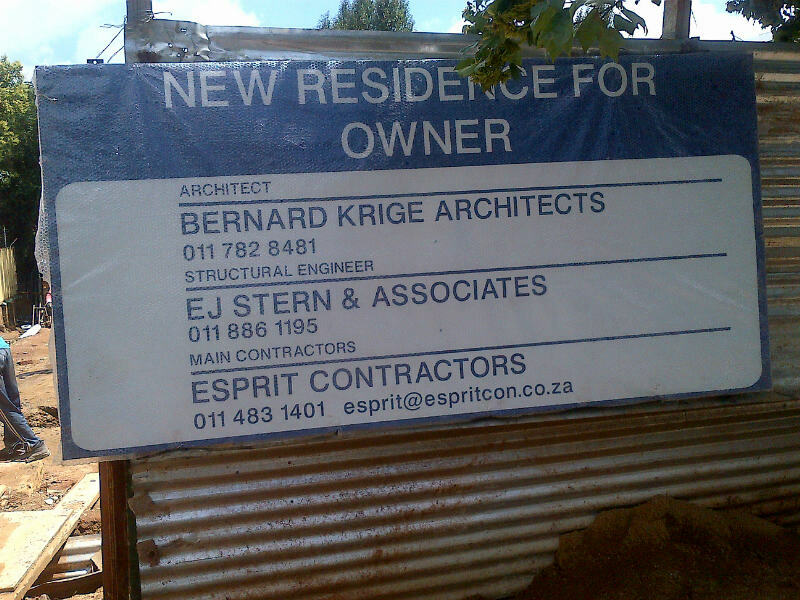 And was also surprised to see that a board detailing the contractor, architect and engineer had finally gone up. An official board at last. Hopefully mid-January will see us getting off to a positive start under sunnier skies. 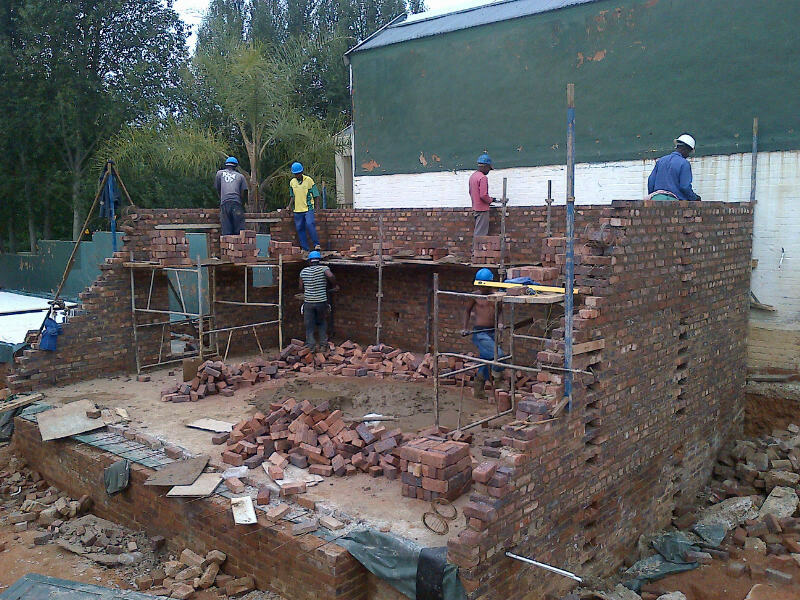 Tags Building from scratch in South Africa. It’s not often that one gets a happy surprise when building, but I have just had one: Took a drive down to the site and there, to my amazement, were actual walls rising above the level of the ground. The building of the garage is now well under way and I imagine Mark is hoping to get it into some sort of usable space before the Xmas break. Really visible progress at last. In this picture you can clearly see the door through to the laundry and the window into the kitchen yard. Above the Ground at last! It’s more than a month since I last wrote and I wish I could say there was a month’s worth of visible progress to see. Sadly, that is not the case. When anyone asks me how the building is progressing, I have only one response; ‘slowly’. 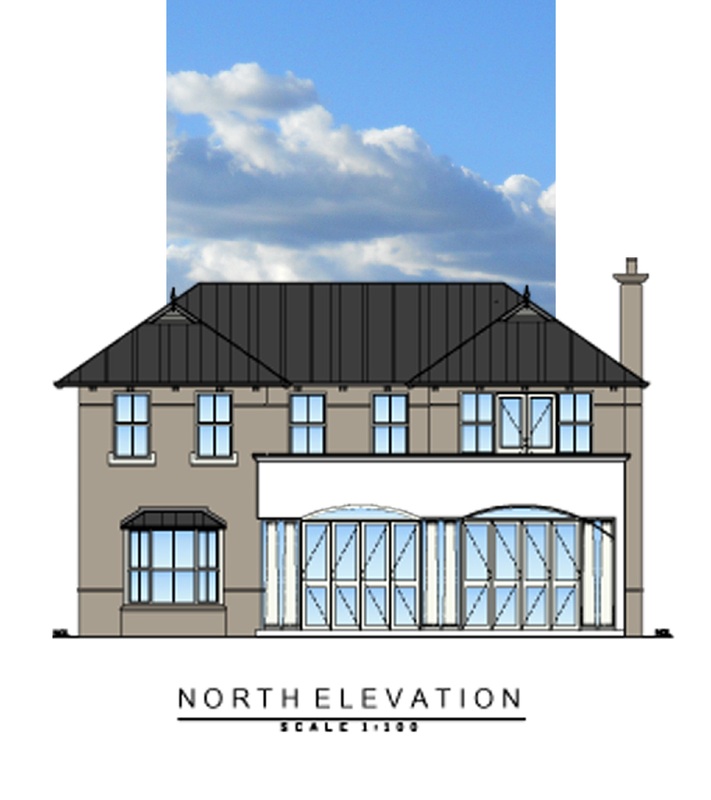 We definitely did not anticipate how long the site preparation would take and adding that to the ponderous process of getting permission to demolish and then getting the plans approved and passed, more than a year has passed since buying the site and we have little more to show for it than a footprint. Exacerbating the situation is the weather: We’re now well into the summer storms and torrential rains. More than 83 mm of rain fell on the site during one storm alone about 2 weeks ago. We had anticipated this problem which was why 6 months ago we had naively hoped that the roof might be on before Christmas. That particular storm delayed the compacting of the soil that had to be done before concrete could be poured and it was days before the engineer felt that the process could begin. But under the surface of things – literally – quite a lot has happened. 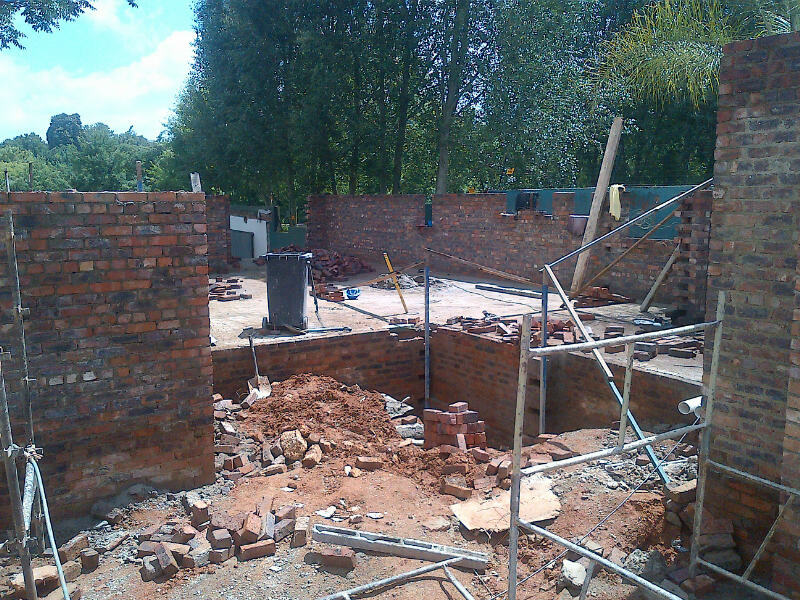 The foundations for the house and garage are finished and a lot of attention has been paid to waterproofing. Our consulting engineer is proving to be a stickler for detail and although it can seem frustrating at times, I know in the end I’ll be grateful for the attention to detail he’s shown so far. With so much excavating and backfilling we need to have confidence in our damp-proofing. The electricians have been on site to make provision for conduits that will run under the concrete slab of the ground floor so we have had to give careful thought to the position of wall plugs in the downstairs area. We also had a very welcome visit from our ‘Off Shore Consultant’; an engineer who now lives in Australia. It was lovely to take someone onto the site who not only just ‘got’ exactly what we’re trying to achieve, but who also asked lots of searching questions, made practical suggestions and with whom we compiled a list of little things to check with Bernard. Thank you Fred! You’ll have to visit again when there is a house to see. The site itself still looks chaotic to me and this is something I find irritating. It is an awkward site in that it is long, narrow and on a slope. There is very little storage space for building materials but I can’t help feeling that if they could get further ahead with the driveway and garage, they would create an easy and practical area for piles of sand and stacks of bricks. There have been a few minor grumbles from ‘neighbour on the left’: A truck clipped a piece of her electric fence and she objected -with reason – to building sand being dumped in the road. We’ve managed to sort these issues out without drama. Every complaint comes with a tagline threat of legal action. It’s not a line of approach to which we’re accustomed…. A few weeks ago I started to feel a little discouraged with the painfully slow process but following a good meeting with Bernard on Friday, my enthusiasm has been renewed and I’m sure that in the New Year we will start to get onto more interesting things. Builders, contractors and all related services take a month-long break in this country, from mid-December to mid-January, and like many other professions, there is a strong sense of winding down from as early as the end of November. So we’re putting the building process on a back burner for now and instead giving some thought to other aspects like bathroom and kitchen layout and finishes. At this stage, Mark – the contractor – hopes to get the concrete poured throughout the ground floor of the house and garage and the screeding done. We have a new foreman on site now. The original one fell out of a tree. Fortunately that did not happen on our site. He is recovering but it seems he will be put on another project once he returns to work. Now we have Rupert and so far I have felt that he pays close attention to details raised at the site meetings and follows up on them. 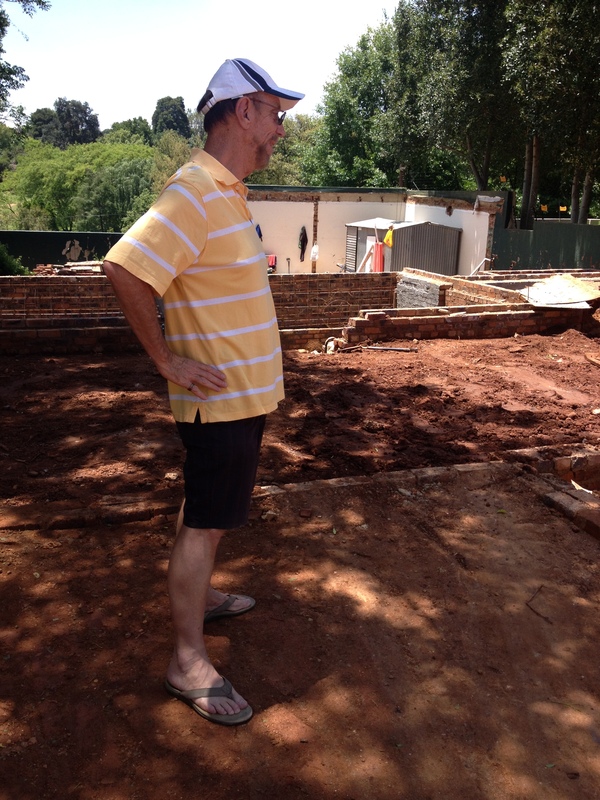 He hopes to still be able to make a start on the brickwork of the garage over the next two weeks. But we’re not holding our breath.